Continuing, Parallel Project Research, Artists Travel Sketchbooks. The first of the artists I will look at in my examination of artists sketchbooks will be Delacroix. Delacroix had both an advantage and disadvantage of the time he was born in. He lived in the time that people general stuck close to home and did not travel extensively. Coupled with this was the fact that art materials we not conducive to working in front of the motif. However, the time he was born in was the Age of Enlightenment, and following Napoleon’s campaigns plus the artistic and scientific exploration of that region (North Africa) the French were keen to push further in their expansion policies. The French has occupied Algeria in 1830, and in 1832 the Comte de Mornay sent a diplomatic mission to Algeria and Morocco. Delacroix had been invited to accompany this expedition, and did so. (Open.edu. 2018). His drawings, sketches and the books themselves are a combination of observations, ideas and sketches. Quick pencil sketches are crowded in along with watercolour sketches, penned notes as well as ink drawings. Delacroix made the most of this opportunity to travel with the mission. He sought out subject matter for an audience back home in France who were eager for information and images of the exotic foreign countries. Much of Delacroix’s work was on the landscape and buildings which were very different from that of rural France and the buildings differed greatly with their pointed arches, minarets and turrets. 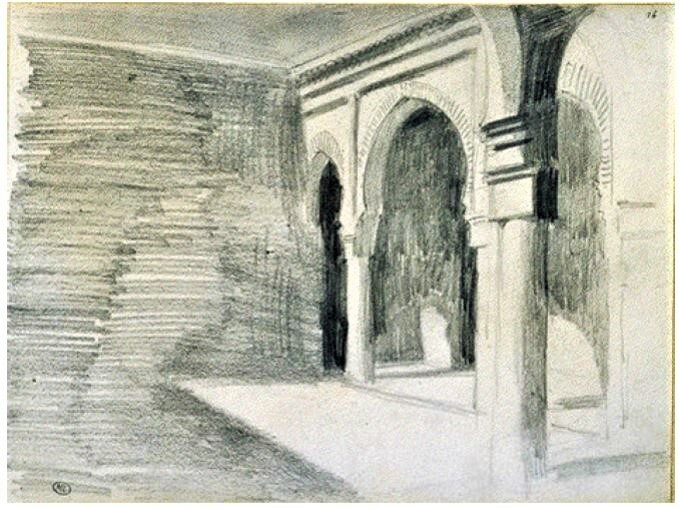 He did seek out subject matter in the people of Morocco but found difficulty drawing the Muslim women due to social and religious conventions. 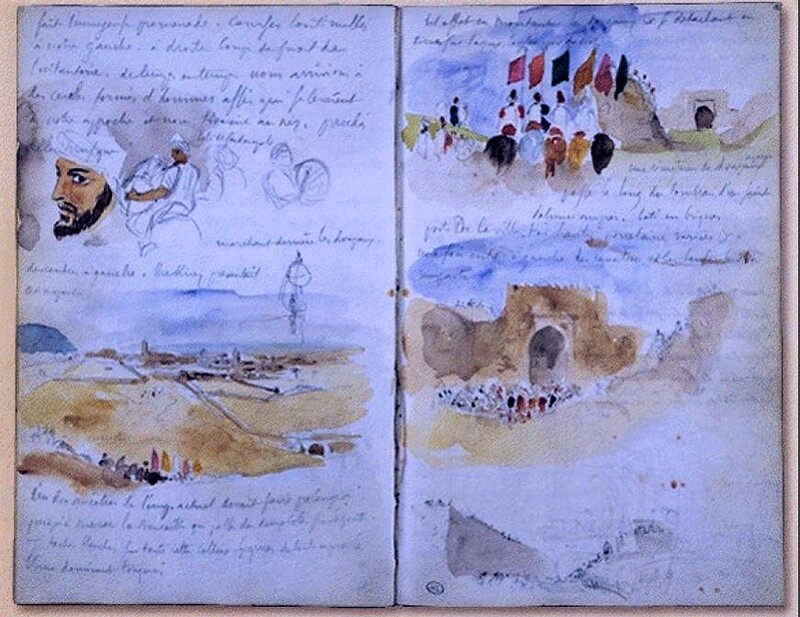 The sketchbooks were also used as notebooks for his ideas, insights and other observations he made on his travels. 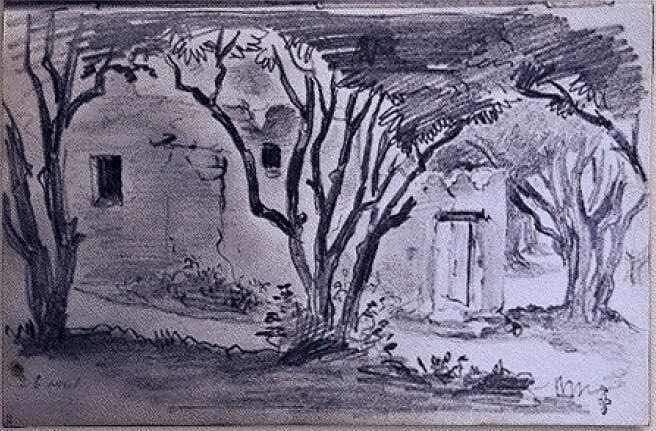 These sketchbooks provided him with source material for his paintings for decades to come. Things to learn from his sketchbooks include his minimal use of lines just using minimal line or shapes to define structure in his quickly rendered watercolour drawings as well as the use of shadow in his graphite and watercolour sketches. His use of just a few lines to describe a shape or form illustrates the economy of line required to dictate form and shape. 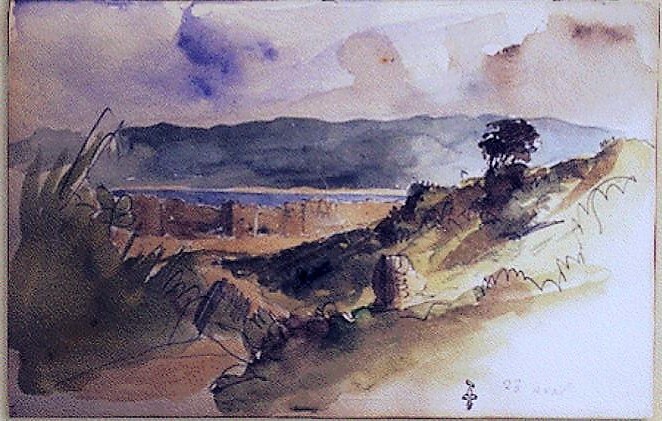 Above all else Delacroix was greatly influenced by his exposure to the exotic life, landscape and people of North Africa. They were key to many of his later works due to his keen observation of nature and the world around him. Additionally, the strong light and how this plays with the brightness of colour and tone also greatly impacted on his art. This strong light must have had an influence on his division of tones to lend drama as well as his natural use of colour employing contracts to create harmony as well as supporting his use of strong tones. In his watercolour sketches he uses the minimal of line to enhance the washes of colour, lending these form and substance to depict the scenes of daily life, buildings and landscape in Morocco. These sketches often span the two pages of a notebook with separate drawings crowded in amongst the notes and drawings he made. 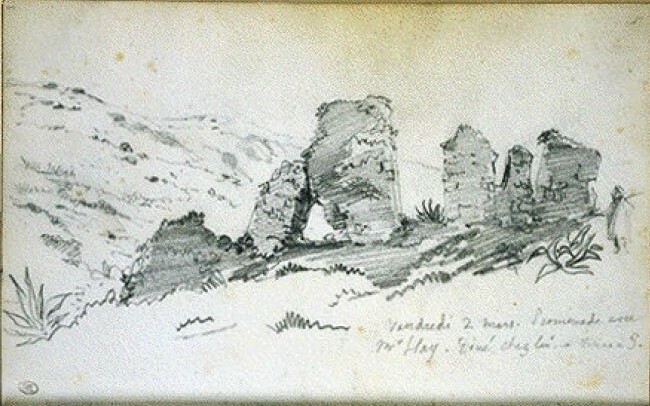 He filled numerous sketchbooks during his travels in Morocco of which I have been able to find several online in their entirety. (Aquarelle.mondialvillage.com. 2018) and (Corsair.themorgan.org. 2018). 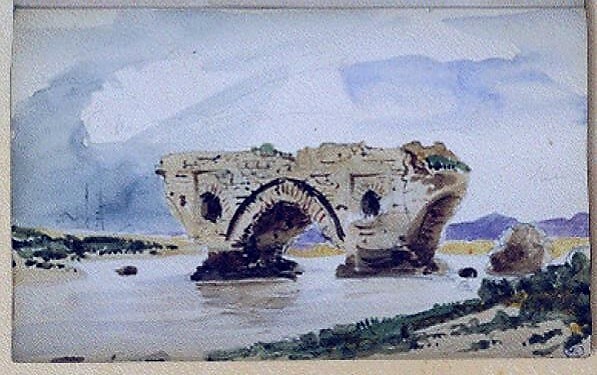 Delacroix made other journeys including several in France and another sketchbook available online is the Tours Sketchbook (Bouffier, J. 1994).and (Metmuseum.org. 2018). Open.edu. (2018). [online] Available at: http://www.open.edu/openlearn/ocw/pluginfile.php/614922/mod_resource/content/1/avnotesa207_6.pdf [Accessed 2 May 2018]. Corsair.themorgan.org. (2018). WebVoyage Titles.- Moroccan sketchbook [online] Available at: http://corsair.themorgan.org/cgi-bin/Pwebrecon.cgi?SC=Title&SEQ=20180403131248&PID_YiN_YiQzwEULcB6tmsYxYnkHSnUC&SA=Moroccan+sketchbook+by+Delacroix [Accessed 2 May 2018]. Metmuseum.org. (2018). 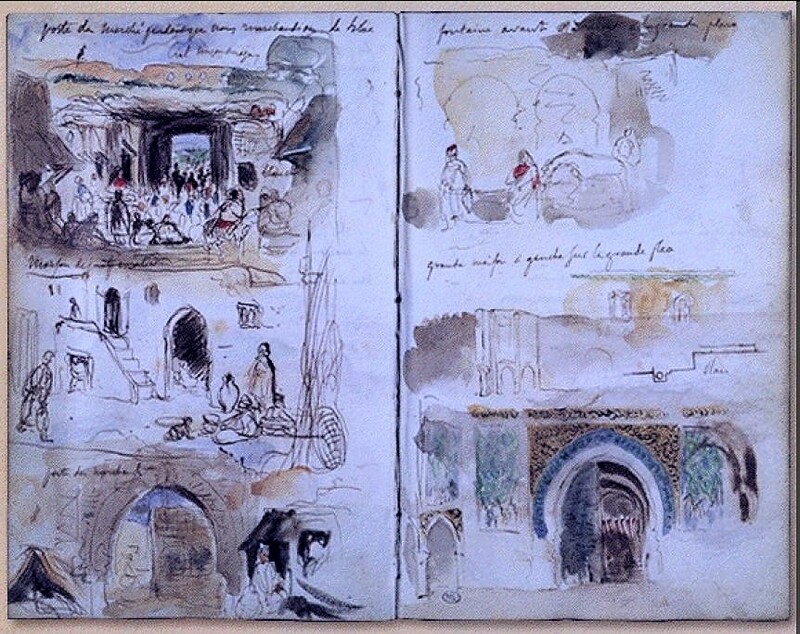 The Tours Sketchbook of Eugene Delacroix. 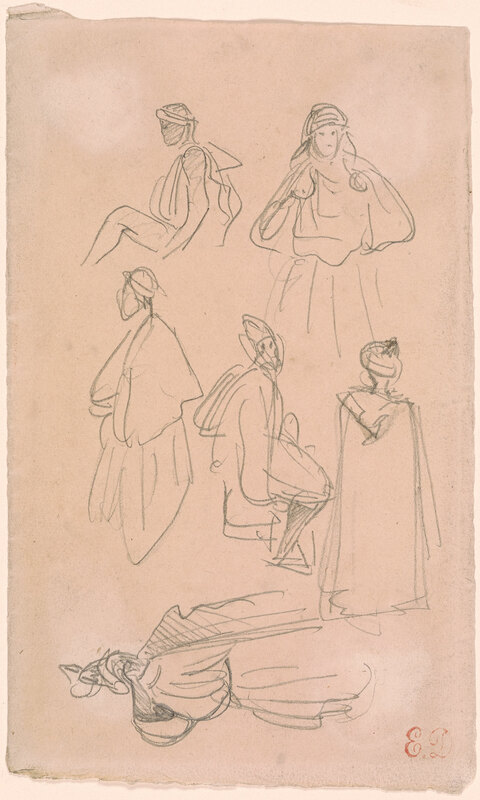 [online] Available at: https://www.metmuseum.org/art/metpublications/The_Tours_Sketchbook_of_Eugene_Delacroix_The_Metropolitan_Museum_Journal_v_29_1994# [Accessed 2 May 2018].